The Emergency Fire & Rescue Unit or E.F.R.U. has been formed in August 2006. Its main objective is that of assisting the local authorities in case of a national emergency or when officially called upon by them. The unit continuously trains in various disciplines such as High Angle Rescue, Rope Rescue, Cliff Rescue, Fire Fighting, Sea Rescue and Rescue Diving. Thankfully enough, our little island is blessed to the point that national emergencies are seldom documented and in order for E.F.R.U. 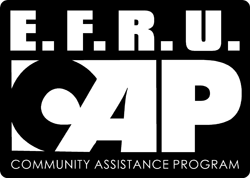 to make better use of the training its volunteers receive on a weekly basis, and to be of better service to the community, the executive committee has formed the Community Assistance Program (C.A.P.). E.F.R.U. offers to assist charitable and youth organizations in First Aid, Land and Sea Rescue backup during fundraising events, Informative Talks having to do with fire and first aid awareness, Rescue Demonstrations and finally even by organizing Events, on their own initiative, to assist charitable organizations reach their goals. It is very important to mention that E.F.R.U. and its volunteers always give training the first priority. In this regards not all requests for assistance can be accepted but stands to reason that only a certain number of hours per month are allocated for the program. It is therefore very important for those who wish to avail from such to contact the Director or Senior Operations Manager through the web site (www.efru.org) as early in the year as possible in order to avoid disappointment. Are you a charitable or youth organization trying to put together an event for the benefit of those in need?